For those that follow this blog regularly you know that yesterday I went out and bought a Mac Pro to compliment the MacBook that started my adventures into the Mac world after spending the last 24 years in the DOS/Windows camp. I won’t go into too much detail here because my first day post with the MacBook and subsequent posts leading up to this one make it pretty clear that I have been impressed enough to actually switch to Mac. But didn’t I switch to Mac back when I bought my MacBook? No, not really. I was still actively using my Windows machine on a daily basis because it’s where my development work gets done. I just constantly found myself wanting to spend time on my MacBook. It was new and interesting and even though I’ve had a couple of stumbling blocks early on I was just drawn to the machine. OS X is a deceptively powerful OS, one that combines a nice simple interface for novice users with incredible flexibility for people that want to dig in just a little. It seemed like every day I found some cool new feature within OS X which is why writing this blog has actually been pretty darn easy. There were just a couple of things that frustrated me with my MacBook – and they were simply because I was trying to make a small, highly portable machine perform heavy duty desktop tasks. Working with the screen on the MacBook just didn’t provide the kind of real estate I needed; even with a 320GB hard drive added in I was limited in disk space and I really need more than just 2 USB ports if this is going to be my primary machine. I love it as a travel system though – I was just ready to replace my Windows desktop with a Mac and really make the switch. My earlier experiments with VMware Fusion had gone really well and I was confident that I could actually switch completely to Mac now and simply run Windows inside a VM for my development work. I considered the iMac but ultimately decided on a Mac Pro. I already had some beautiful monitors in the dual Samsung SyncMaster 204Bs and I love the idea of running Fusion on an 8 core system. The price of the Mac Pro seemed a bit steep but in reality I ended up paying less than I did for my state of the art XP rig just over a year ago. 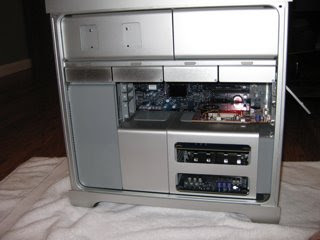 I had mentioned on this blog several times that I was ready to go "all in" and get a Mac Pro and several folks recommended that I should consider buying refurbished directly from Apple instead of buying new. The comments I received were that the refurbished machines were just like buying new except that they 1) cannot be customized from Apple and 2) come in rather plain looking cardboard boxes. 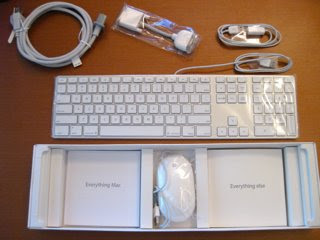 Sure, it wasn’t the pristine packaging you get with a new Apple system. Ok, that was a non-issue for me. According to Apple they take in machines that are returned for a variety of different reasons and then go through an exhaustive set of tests to recondition the product for resale. What I found inside the box was what appeared to be a brand new machine. The only flaw I could find was a tiny little nick at the top edge of the keyboard. That was it. Going this route saved me $400. When you buy a Mac Pro you are buying a nearly complete system; the only thing you really need to purchase is a monitor, though external speakers are also recommended. 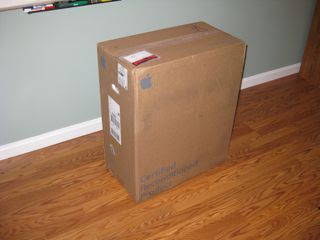 When I pulled out the Mac Pro I promptly placed it on a towel on my hardwood floor and opened the case. The fit and finish of the aluminum case is fantastic. No tweaking or pushing to align pins so the case cover fits. Inside is the cleanest looking interior I have ever seen on a desktop PC. My Windows XP machine is a jumble of interior cables and wires. Even using tie straps (which I do) you can only do so much cable management inside a custom built PC. The Mac Pro interior is stunningly clean. Installing the drives and memory took me minutes. Adding the new drive in went so fast that I pulled it back out, set up my little Canon SD1100 in video record mode and shot a video of it. I was that impressed. Adding to the memory was also very simple. There are two risers in the lower portion of the system that slide out by tugging on the two large holes at the end of the card. 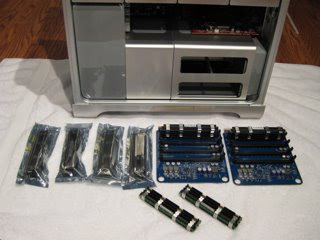 The DIMMs are inserted into the cards and they are placed back in – pretty basic. The memory itself must be matched up to like memory – RTFM on this one. I had 2 1GB sticks that came with the machine, 2 1GB sticks that my friend Dr. Michael Roach at Digital Apple Juice sent me since they were extras after he bought his Mac Pro and then I ordered 4 2GB sticks from OWC. This gave me a total of 12GB of memory – plenty to do everything I need for the foreseeable future. Once I had fished all of the external cables and had the Mac Pro sitting in the primary location I went through the startup process. The Mac Pro came to life quickly and before too long I was in OS X and ready to go. It recognized that I had two new drives in the system and prompted me to run Disk Utility on them. I simply created two full size partitions using Mac OS Extended (Journaled) on each drive. It took all of a couple of minutes before both drives were ready. So much better than the hours it would have taken than the default Windows option to partition and format those drives for NTFS on a Windows machine. The system itself is extremely fast, as I expected it to be. The first thing I did was install VMware Fusion and move my Windows XP image from the MacBook over. It took a little configuring and reactivating Windows XP but very quickly my VM was up an running. Once is was up it ran Windows and my entire development environment perfectly. I could run it in full screen mode if I felt nostalgic, keep it in a window or even run it in Unity mode, which VMware supports. My development environment just appears as a "Windows" looking window on OS X. On of the first applications I installed was iStat menus so that I could keep an eye on the system as I was installing and working with applications for the first time. Displaying the logical CPUs in the menu is almost comical since I now have 8 little graphs showing CPU. The only task that seemed to make the machine work hard was when I imported 20K + pictures into iPhoto. I’m still going through and trying to figure out which of the many applications I’ve been playing with on the MacBook will make it over to the new machine. My photo and video collection are already on it, my complete iTunes library is now there and I have just a few more key pieces that were on the Windows machine that will now be on the Mac Pro. My Mac Pro came with a full size thin aluminum keyboard. While it has the same key spacing and feel that my beloved MacBook does, it is not as comfortable to type on as I hoped it would be. I have to arch my wrists a bit more than I am used to and lose my place on the "home" keys pretty easily. This is in part because I am coming from using the split keyboards from Microsoft for so many years. I am going to keep trying to get used to the Mac’s native keyboard for a little longer but may end up either moving the Microsoft keyboard over to the Mac Pro or try to find a split key model that is specific to Mac. Unlike the keyboard, which I may be able to tolerate, I could not get used to the Might Mouse. While I love the little track ball that serves as the scroll wheel, the buttons on it just feel odd. When I use my mouse I have a tendency to rest my palm on it and I felt as though I was activating the mouse all the time. I also really struggled to get the right clicking to work. Fortunately I have a Logitech mx510 gaming mouse that has drivers for OS X. This mouse works fantastic and with the additional buttons I am able to activate Spaces, use the forward and back buttons, etc. quite easily. After much debate – basically me talking to myself yet again – I decided to name the new Mac Pro "Force" as in the Force from Star Wars. Thanks to Roger for being the first to suggest that one when I asked for a little help. The Force is strong within this one.